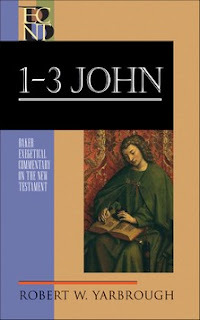 Robert W. Yarbrough, 1-3 John (Baker Exegetical Commentary on the New Testament; Grand Rapids: Baker, 2008). The text-critical "remarks" are there after each section, with generally fairly brief remarks (often not much more than a couple of sentences, never as much as a whole page) on each variant, perfectly sensible as far as a quick survey can reveal. Occasionally, having encountered a commentator taking the text-critical discipline seriously, one wished for fuller discussions (e.g. on 1 John 4.3 and 5.7). I can't detect any global tendency in his text-critical remarks. I didn't find a place where he disagreed with NA27 (on the three passages where ECM differs from NA27 he is non-committal either way - perhaps partly because they lack much exegetical significance). I like the idea of addressing every variant given in NA27, since that will be useful for students beginning in textual criticism. I also like the way he speaks of the integration of textual criticism and exegesis. A couple of days ago I received a copy of Philip Comfort’s publication, New Testament Text and Translation Commentary: Commentary on the variant readings of the ancient New Testament manuscripts and how they relate to the major English translations, published by Tyndale House Publishers. The volume is primarily an in-depth textual commentary on the major variants in the NT, with references to how various English translations have handled the text included at times. From what I’ve reviewed so far, the volume should be a great help for students since it offers far more info than Metzger’s volume and covers more variants, with the analysis often including various viewpoints from commentaries as well as text critics. It’s a substantial volume—899 pages, and seems to be up-to-date on the manuscript evidence as well as textual arguments. For most of the treated variants, the readings are given in both Greek and English, the major witnesses are listed for each, and then a discussion of the data and most likely reading follows. When English translations differ on what they are printing, they are mentioned as well. Overall, the volume looks to be a solid addition to the growing number of resources in the field for both exegetes and TC students. Haaretz has released an article on the recent discovery of a Hebrew ostracon which may date to ca. 1000 BCE. It is not yet clear exactly what the text is about. Article and photo here. Many of you probably know that the St Gallen library in Switzerland have begun to digitize parts of their precious manuscript collection on-line; the resource is called "Codices Electronici Sangallenses (CESG)." (Digitale Stiftsbibliothek St. Gallen). There are now 144 MSS online. Recently the library received a $1 million grant for the purpose of digitizing all 355 MSS that were written before 1000 C.E. This new project is called "Virtual Abbey Library of Saint Gall," which is in turn part of a larger national project, "e-codices - Virtuelle Handschriftenbibliothek der Schweiz." The Bodmer Foundation is also part of this project. However, the project only concerns medieval MSS so we cannot expect their papyri on-line in this forum (sob...). "ST. GALLEN, Switzerland — One of the oldest and most valuable collections of handwritten medieval books in the world, housed in the magnificent baroque halls of the library in this town’s abbey, is going online with the help of a $1 million grant from the Andrew W. Mellon Foundation." Update: The Birmingham Colloquia on the Textual Criticism of the New Testament will be held in in conjunction with the Codex Sinaiticus Conference, British Library, to mark the completion of the Codex Sinaiticus Project. Further information will be posted on the ITSEE site as it becomes available. In addition to invited speakers, there will be the opportunity to present papers on matters related to Codex Sinaiticus. Those who are interested may contact Hugh Houghton at H.A.G.Houghton@bham.ac.uk. [i] For example, the Chester Beatty collection, P45 (four gospels and Acts), P46 (Pauline epistles), P47 (Revelation), could have functioned as something like a ‘New Testament’ collection. P74 (Acts and the Catholic Epistles), from a later period, reflects a standard portion of the New Testament as canonically arranged. [ii] We should note, however, that evidence from early Christian papyri is important in considerations of the reception, acceptance and influence of the separate books, and can be of importance in relation to issues relating to the NT canon. The most popular non-canonical document, the Shepherd of Hermas, is extant in large numbers of papyrus manuscripts, reflecting its undoubted popularity (and probably some acceptance of its authority and even ‘inspiration’ among its readers); while the worst attested of the larger New Testament documents is the Gospel of Mark, with relatively few manuscripts, and relatively few other indications of its influence. [iii] Neither of these large formats had substantial longevity, and the vast majority of NT manuscripts of the later period reflect separate bindings for the four gospels, the Pauline epistles, and Acts and the Catholic Epistles. In antiquity this triangular plant was cultivated, cut into strips and made into sheets of papyrus, a product that could be exported from Egypt throughout the Greco-Roman world. 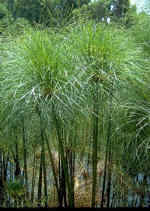 Of papyrus exported from Egypt Pliny could say that ‘on it human civilisation depends’. And early Christians used this in order to communicate in antiquity. And among the many thousands of papyrus documents excavated, discovered and published in the last hundred and fifty years or so (say 50,000 documents and 5,000 literary texts), something over one hundred represent texts of the Greek New Testament (incidentally, outnumbered by other literary texts like Homer, Euripides, Demosthenes). [ii] J.K. Elliott, A Bibliography of Greek New Testament Manuscripts. Second Edition (SNTSMS 109; Cambridge: CUP, 2000), 1 & 5-9 for bibliographical details. [iii] Cf. also K. Aland, ‘The Significance of the Papyri for Progress in New Testament Research’ in The Bible in Modern Scholarship: Papers Read at the 100th Meeting of the Society of Biblical Literature, December 28–30, 1964 (ed. J. Philip Hyatt; Nashville: Abingdon, 1965), 325-346, esp. pp. 325-333 for developments between 1881 (Westcott and Hort) and 1964. Jim Leonard has compiled a helpful list of papers to be presented at the ETS conference (Nov 19-21 2008, noted briefly here) on the subjects of Text and Canon (which includes several ETC bloggers) at his blog entitled 'Text and Canon' here (for a comparison with last year see my scurrilous comments at ETS 2007). I hope that some ETC bloggers or other guest-posters might be able to summarise some of them on the blog for those of us who can't be there. Any volunteers? If you are not bothered about the data, then the conclusions are on pp. 23-24. The Tyndale House Newsletter Autumn 2008 is out! Here you can read a brief report about shooting New Testament manuscripts (the CSNTM expedition to Cambridge), the Text and Canon project launched this year and directed by Peter Williams, Simon Gathercole and Dirk Jongkind, and many other interesting stories under headlines like "Ramadan at Tyndale" and "The Dead Sea scrolls reveal more" on the DSS. From this index you can access older issues. I was rather surprised to find that the Tyndale House Newsletter had never been mentioned on this blog (according to my search), in light of the comprisal of our blogteam. Does it reflect a theological tendency of some scribes (i.e., Christian modesty)? 11.10 Prof. Richard Hays (Duke University): "Matthew's Reconfiguration of Israel's Torah." 12. 05 Dr Peter Head (Tyndale House): "The Four Gospel Codex: Reconsidering the Manuscript Evidence"
Lunch: Lunch is not provided but if you bring sandwiches you may eat them in the Faculty common room. 14.00 Prof. Markus Bockmuehl (Keble College, Oxford): "Stanton's Jesus and the Pope's"
14.55 Prof. Judith Lieu (Robinson College): "Mapping Partings"
I've now listened to the BBC programme by Roger Bolton here. The level of spin is pretty high, e.g. when we hear that the Shepherd of Hermas being 'dropped from the canon' (implying that it had a canonical status from which it could be dropped) and associating this with Constantine. There is also a fascinating bit of editing, whereby the variant 'becoming angry' in Mark 1:41 is associated with Codex Sinaiticus (which of course doesn't have that reading). At 22 minutes 17 seconds into the recording we seem (at least from the intonation in David Parker's voice) to be breaking in midway through a sentence of his: '... in a codex Jesus is angry...'. The 'a' is almost sotto voce and the quotation continues discussing Mark 1:41. Then at 22 minutes 58 David is talking about 'the codex', meaning Sinaiticus. Since Roger Bolton's voice has interrupted between these two quotations one might suspect that a false join has been created between two quotations. Anyway, whatever happened Bolton has created the impression that it's Codex Sinaiticus 'the world's oldest Bible' which will shock Christians by revelations of an irascible Jesus. We are pleased to announce the recent publication of Hugh Houghton's monograph Augustine's Text of John: Patristic Citations and Latin Gospel Manuscripts by Oxford University Press. What sort of Bible did Augustine have? How did he quote from it - and was he accurate? Do Augustine's biblical citations transmit readings not found in any surviving manuscripts? This book is part of a major project on the Old Latin versions of the Gospel according to John, and uses Augustine as a test-case to examine the importance of the evidence provided by the Church Fathers for the text of the Gospels. The early history of the Latin Bible is reconstructed from Augustine's comments in his treatise De doctrina christiana (On Christian teaching). Details are assembled from sermons, letters, and other writings to show how Augustine and his contemporaries used the Bible in the liturgy of the Church, public debates, and in composing their own works. Augustine's own methods of citing the Bible are analysed, and features are identified which are characteristic of citations produced from memory rather than read from a gospel codex. The second part of the book is a chronological survey of the biblical text in Augustine's works, showing how he switched from using the older versions of the Gospel to the revised text of Jerome, which later became known as the Vulgate. Finally, a verse by verse commentary is provided on all the significant readings in Augustine's text of John, assessing their significance for the history of the Latin Bible, and in some cases the Greek tradition as well. Details are also given of Augustine's exegesis of particular verses of the Gospel, making this an indispensable handbook for biblical scholars and church historians alike. Hugh Houghton of the Institute for Textual Scholarship and Electronic Editing (ITSEE)in Birmingham informs me that a new version (1.3) of the Vetus Latina Iohannes Electronic Edition has been uploaded. It includes four new witnesses, 22B, 32, 33 and 48. There have been a number of corrections in the transcriptions. Moreover, the manuscript description page now includes the dates of all the witnesses. Feedback is welcome. Hugh has underlined that the electronic edition is still work in progress. There has been constant proofreading for the last year, and this phase is planned to be completed sometime in next year. ITSEE has recently appointed a new Research Fellow, and the institute is making very good progress towards a print edition. I have been using the electronic edition during the last couple of days for a paper on the Periocope of the Adulteress for the upcoming SBL (on what Jesus wrote on the ground). One conclusion is that the PA is attested by most OL witnesses (extant in this part of John). I can only recommend this valuable resource. The Oldest Bible in the News! The BBC has an article on Codex Sinaiticus here. What can we say about this article? It took me till the seventh paragraph before I found a paragraph without a factual mistake (oops Roger Bolton, this is even for sensationalist journalism rather poor). 1. Codex Sinaiticus is not the world oldest (Christian) Bible. 2. It did not lay undisturbed in a monastery. It was disturbed over the centuries given the corrections from the 7th/8th century, the mediaeval Arabic notes, and the fact that the manuscript had been split up sometime before the end of the 18th century. When the manuscript arrived in the monastery no-one knows. The year 1844 is correct, at least for a part of the manuscript. Other parts were 'discovered' in the years 1845-50 (Uspenski), 1853, 1859 (both Tischendorf), early 20th century (Beneshevich), 1975 (the opening of blocked off room). 3. Ok, no factual mistake in this paragraph, I was too quick with my judgment above, penitentiam agite. Well, I hope there will be no mistake. I very much hope, because it would be great if by next July the whole codex is on-line including all the recent bits found at Mt Sinai. 4. Will there be uncomfortable questions to answer? Will there be anything 'new' in the on-line publication that was not known for the past 140 years? Come off it. I'm glad the codex comes on-line, but there is very little about the text of this codex that was not known before (the text of the 1975 fragments comes from the Greek Old Testament and from the last book added to the New Testament, the Shepherd). And let's face it, the Christian church has known about and studied and written on the differences between Bible manuscripts since the second century! 5. "Crucial verses about the Resurrection are missing." I have read the New Testament a couple of times, and I may be one of the few people who can say that I have read the New Testament text of this codex more than once. I found the resurrection narrative complete in Matthew's gospel: the text of Codex Sinaiticus does not miss out on verses telling about the resurrection. Neither is the resurrection in Luke missing, and the story is all there in the gospel according to John. I have not counted all the times that the resurrection is mentioned in any of the other books of the New Testament, but most of these verses are all there. Makes me wonder what Roger Bolton is referring to (as there are so many references to the resurrection it is difficult to single some out as 'crucial'). Perhaps he is thinking about the last verses of Mark, where the AV has an account of the resurrection in Mark 16:9-20, but which is not present in many modern Bible translations (as it is suspected by many to be a later addition to this particular gospel). I don't think any user of a modern Bible translation has felt the need to answer the so-called uncomfortable question of why these 'crucial' verses on the resurrection are not there as the resurrection is everywhere in the New Testament. 6. Constantin Tischendorf (the German who took part of the Old Testament to Leipzig in 1844 and most of the remainder to St Petersburg in 1859) as Indiana Jones! This must be correct, everyone will see the likeness between the two at first sight! The codex was indeed made in the 4th century, yet the monastery was built in the 6th century. Unlikely - let's call it impossible - that the codex was hidden in it since the 4th century. Yet I haven't lost faith because of this article: I still believe that there are people at the BBC who know what they are writing about (clearly, the desperate call of someone who duly pays his licence fee). I wouldn't expect that either Bart or David are particularly impressed with this article. Having said this, bad publicity is often better than no publicity: keep manuscripts in the news! I am not going to continue with the numerous other errors, misconstruals, and straw-men in the BBC article; after all, this is a serious blog. Recently I was nominated by Prof. Larry Hurtado, Head of the School of Divinity at the University of Edinburgh, for a Northern Scholars scholarship. The nomination was met with approval by the Northern Scholars Committee. Thus, on March 9, 2009 I will give a "Northern Scholars lecture" in Edinburgh (the date on this page is wrong). "The New Testament in the "Original" Greek: Westcott and Hort Revisited"
On the same day I will also deliver a paper in the research seminar. The last (and first) time I was in Edinburgh was at the SBL International Meeting 2006, and that was a very nice experience. I remember there was a very fine exhibition of old Bible editions just outside Larry Hurtado's office. The door to the office was so huge that Goliath could have entered without having to bend his head. Latest news from CSNTM tells us of a new feature of the website — “TC Notes.” In this section textual scholars are offered some more specific data on manuscripts. The first TC note is about a manuscript presumed to be missing from the Fitzwilliam in Cambridge, Greg.-Aland 1281. It has now been located again during the CSNTM-team's recent visit to Cambridge. Update: The original TC Note on Greg.-Aland 1281 has been corrected as the result of some corrections in the comment section on this blog, e.g., the MS in question was never presumed to be lost, but there was incertainty about the shelf number (TW).